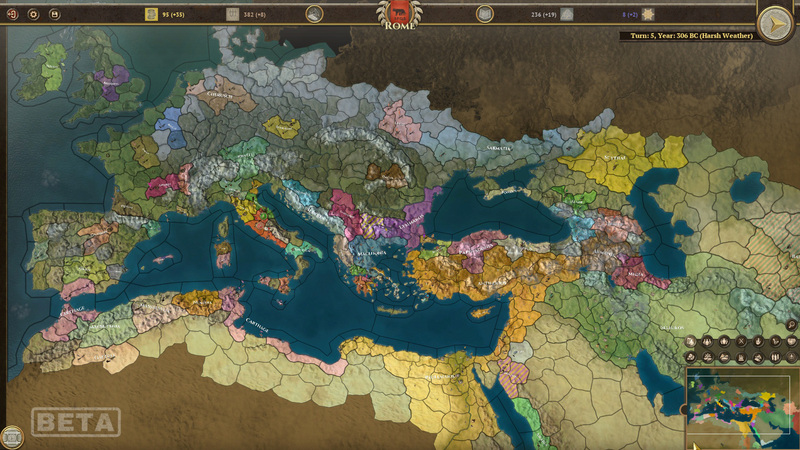 Welcome to the first Field of Glory: Empires developer diary! We felt we ought to start off with a summary of what the game is, and what you can expect. We will be following on with detailed explanations in subsequent diaries. 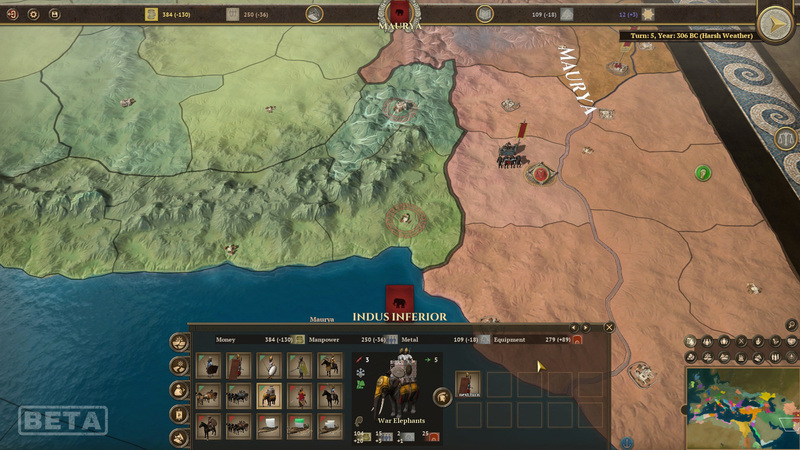 FoG: Empires is a strategy game set in the Ancient World roughly from the fall of Alexander the Great’s empire. It seeks to provide strategic empire management together with the AGEOD staple of turn-based play and historical detail. We believe we have unique features to deliver these, while also remaining familiar and easy to understand for the fans of the genre. Speaking of the features themselves, we certainly have plenty of them in Empires, closely interconnected with one another as it should be in a grand strategy game. Region and population management. In Empires, the map is divided into Regions. Each region has its own population, represented by abstracted units. Each population unit has a culture (which can change) and a status – citizen or slave. The regions can host a number of buildings depending on the level of population. We have a lot of different buildings in the game, both generic and nation-specific. There are a lot of possible synergies in building up your empire-wide infrastructure, but you do not have total control over what is available to build in a certain region at a given time. You will need to adapt to circumstances and make the best of it. Every region also shows its major city/settlement on the map, which can be fortified via building choices to resist siege attempts by the enemy. Finally, trade happens between regions. While it is automated, you will have a lot of influence over it via buildings and other choices. We will talk about all this in detail in the next diary! Battle system. Our battles are much more than just trying to pile up the most number of units in the same place. Unit abilities, quality, and leadership are decisive and will influence your approach to battles and how to conduct your wars. Understanding the strengths and weaknesses of your own forces and those of the enemy will decide the winner. Progress and Decadence. This mechanic simulates the dynamics behind the rise and fall of empires. It has been tried in a few games before, but we believe our approach should please you, as it captures particularly well the momentum some countries can get, and the ebb and flow of successful empires trying to deal with their own success and with new challenges. The details will be the topic of a separate developer diary. The gist of it is, that you will feel pressed to move your nation upward on the "ladder" of nations, but with moving ahead you are sowing the seeds for an eventual decline and possible collapse. A collapse that in turn can lead to a rebirth and restoration, or the start of something new. A fall is not inevitable, but it does not mean game over, either. 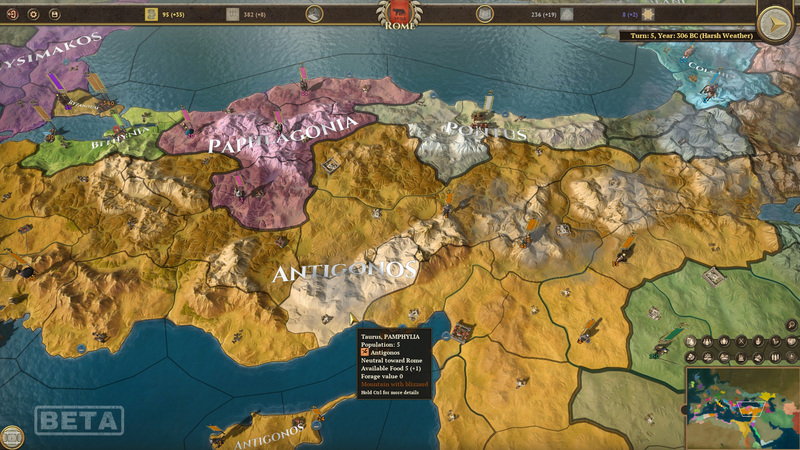 There are a lot more we want to cover (provinces, decisions, types of nations, etc), but we hope to have given you a general idea on what we are aiming for with the game. Stay tuned for the next Diary!